The sun was shining like a blowtorch in Delhi. Such was the weather. But the true level of the fitness of a cricketer can only be regulated in exigent conditions. The mercury had risen above 40 degrees but even then the captain of Kolkata Knight Riders won the toss and elected to field. Batting first could have saved his team from the scorching heat of Feroz Shah Kotla but his decision was inspired by the latest trend of chasing. His decision was very well supported by Andre Russell, who got rid of the openers in the first over itself. Delhi was already low on the economic front after dropping Pawan Negi. Imagine the financial value of a team when it benches a player worth 8.5 crores! Within the powerplay, Delhi Daredevils lost Sanju Samson as well, restricting them to 37-3 after six overs. It was as if what happened 20 days ago was again in the making. In their first match, KKR bundled out Delhi on 98 in Kolkata and their bowlers were perhaps writing another such script. But what followed was the catch in the story. An unfit JP Duminy had paved way for Sam Billings to make an IPL debut. The 24-year old right-hand batsman from England rose to the occasion in such a way that his 105-runs partnership (off 68 balls) with Karun Nair gave Carlos Brathwaite the ideal rostrum to launch the big hits. Brathwaite was also staging a comeback after being dropped from the playing eleven. His 11-ball 34 enabled Delhi to reach 186-8. Not to forget, Karun Nair played the role of a catalyst with his elegant 68. 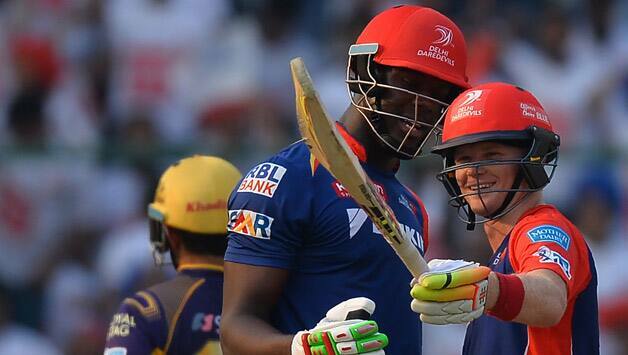 Sam Billings and Carlos Brathwaite were instrumental in Daredevils' attempt to reach 186. An anomalous thing which happened in this match was that after eight years, 117 matches and 387 overs, Piyush Chawla finally bowled a no-ball. With 113 wickets at an average of 26.01 and an economy rate of 7.57, Chawla has been one of the most successful bowlers in the IPL. He over-stepped for the first time today in his second (and last) over. Having conceded 80 runs in the last six overs, KKR yet again proved that if in a team, six bowlers are not enough to restrict the opposition, then the seventh and eight would be of no use either. Although Gambhir used only six bowlers, he had two more options for him. If Rajagopal Satish was not to be used, then what was the point of his being in the team? A proper batsman would have been of more use for the team. 187 was difficult but not impossible. KKR have relied on their openers for the most part of this season. They wanted them to fire but received an early jolt when the captain of Delhi got the wicket of his counterpart in the third over. The think tank astonished everyone by sending Piyush Chawla at No. 3. 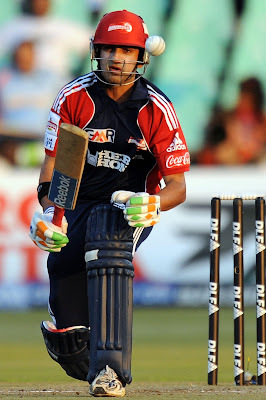 Being given the role of a pinch hitter, Chawla scored not more than two boundaries and eight runs before Zaheer trapped him in front of the stumps. When the in-form Suryakumar Yadav was expected to come in, Yusuf Pathan was promoted above him. Another change which did not go in KKR's favor. Pathan became a casualty of a soft dismissal whilst he was on 10. In cricket, they often say that when someone is scoring runs, make the most out of him. Suryakumar scored an impressed and gutsy half-century against Rising Pune Supergiants at no. 3. He could have been the absolute replacement for Manish Pandey. But the management relegated him to No. 4 vs Mumbai Indians and to No. 5 today. Wickets are always crucial in a chase, but KKR had lost three and that too when the required run rate was above 10. Robin Uthappa did not receive much support from the other end. Wickets continued to fall at regular intervals. What Saurabh Tiwary and Ravindra Jadeja did yesterday, Jason Holder managed to repeat the same today, i.e., unnecessary runout. Without having an idea of where the ball is, the West Indian set off for a run only finding him short of the crease at the end. For over 50 days, Holder was warming the bench. First for West Indies in the ICC World Twenty20 and now for his current team. His needless running was perhaps an indication of his itch to play. After the Daredevils whomped the Knight Riders by 27 runs, it was their first win against them in Delhi after six years. The last they beat them on their home ground was in 2010. The victory was nothing less than a vengeance. KKR dismissed the whole team on 98 in their first meeting this season in Kolkata. Daredevils returned the favor by dismissing them on 159 in Delhi. Ironically, only these two have been the instances where a team has been all out in this edition of the IPL. Delhi is now on the second position of the points table, only behind Gujarat Lions. Kolkata has some boxes to tick in order to gain back the winning momentum. Filling the No. 3 spot unless Manish Pandey returns being the one with the most priority.